We review Welcome to Centerville, a dice rolling board game published by GMT Games. 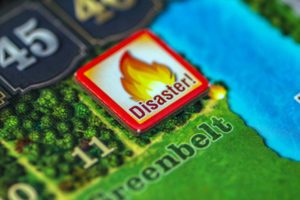 In Welcome to Centerville players are competing to earn the most prestige and wealth by using their dice rolls to build the city of Centerville. City building has long been a favorite gaming activity of mine—I’ve put countless hours trying to connect water pipes in SimCity. 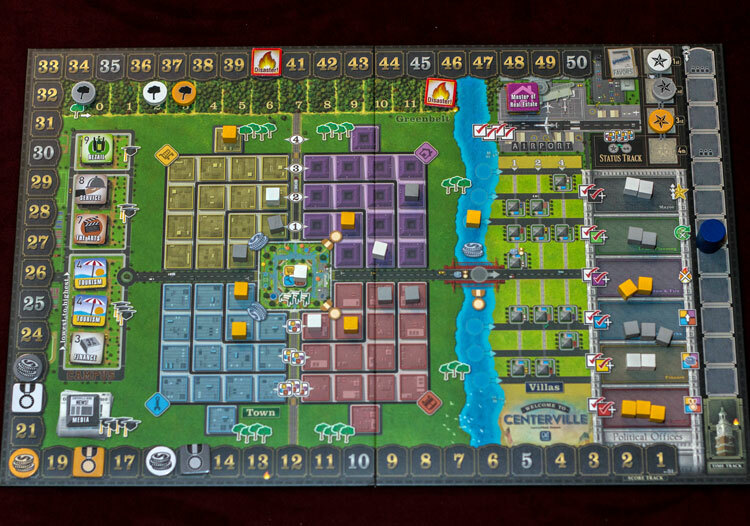 Welcome to Centerville attempts to bring that theme to your tabletop as players work to earn wealth and prestige in building up the soon-to-be bustling metropolis of Centerville. Welcome to Centerville is an area control and set collection dice rolling game for 2-4 players. It plays best with three or more players and takes just about an hour. Welcome to Centerville is played over three rounds, with scoring happening after each round is complete. You will track scores for both wealth and prestige, but your final score is the lower of the two. Being the most prestigious person in Centerville isn’t worth much if you are penniless. The actions you can take each round are determined by a Yahtzee-like dice rolling system. You can roll (and re-roll, and re-roll) your dice each turn. Once you are happy with the result—or out of rolls—the dice are spent to carry out actions. 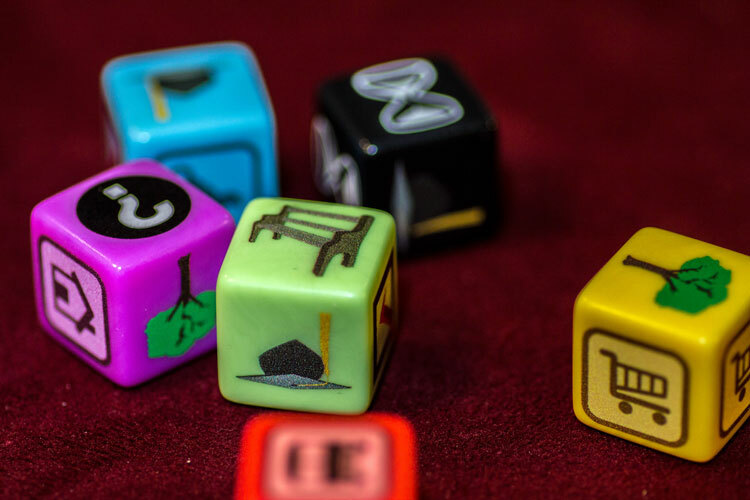 You roll custom dice each round to determine your actions. Building results are used to construct buildings in Centerville, which are scored each round. Trees can be spent to move up the greenbelt track or to develop along the river. River spaces are scored based on the greenbelt. Education results can be spent on vocation tiles, which score at the end of the game. Vote results can be spent to gain political offices, which grant special abilities and you score both wealth and prestige each round based on the number of offices you hold. Hourglass results cannot be re-rolled and progress the game counter toward the end of the round. Fate results—depicted as question marks—can copy the result of another die. The city of Centerville is divided into four sections that are evaluated for majority at the end of each round. Two sections correspond to your wealth and the others toward prestige. The player with the most influence in each section scores 6 points toward either wealth or prestige and the player with the least will lose three points in that trait. The river section scoring works similarly – north of the bridge spaces count toward your wealth while those to the south add to your prestige. There are some other actions you can take if you have a particularly good roll. Rolling four of a specific type will grant you special abilities to use. As the hourglass results get rolled, the time left in the round ticks down. Once it reaches the end of the track, scoring is performed and a small amount of clean up is performed. After three rounds the game is over and whoever has the most points—only counting the lower of wealth or prestige—wins. The game board is divided into various sections each which scores a different way. Welcome to Centerville attempts to take Yahtzee-like gameplay and add a bit more depth and strategy to it. GMT Games is well-known for their extremely heavy euro and wargame repertoire. While Centerville isn’t trying to reach those levels by any means, it wants you to bite off a lot more than you would in most Yahtzee-mechanism borrowing variants. Unfortunately, the disparate systems at play here just don’t mesh together very well. There are various area control elements—having a majority of buildings in each section of the city and having multiple political offices contribute much of the scoring. There is also set collection available with the vocation tiles that can score you both wealth and prestige, albeit in different ways. Disasters can cause unexpected events to shake up your plans. Some of the systems you almost have to participate in. If you let one player hold all the political offices, they will score dozens of points each round in both wealth and prestige and quickly put the game out of reach. This can be a real problem if they are able to secure an office or two and trigger the end of the round in the same turn. Similarly, you can’t ignore building in Centerville as you will lose points for each section you have the least influence in. On the flip side, vocations and greenbelt/river seem fairly underpowered. The education and “tree” results on each dice often felt like misses and the actions you can take with them are consolidation prizes for not getting something more useful. Welcome to Centerville doesn’t do much to give you an immersive experience. The game is incredibly dry and it’s hard to really even feel like you are doing any kind of city building at all. The theme was part of what got me excited to give this a try- and promptly let me down. Vocation tiles can be scored by the number of each you collect and the number of different tiles you have as well. Each time I’ve tried to come up with a strategy about how to approach the game differently. You are given an end game scoring goal as well to provide you some direction. Yet you are at the mercy of the dice and often have to adjust mid-round or even mid-turn to just make the best of whatever you end up rolling. This isn’t necessarily bad, but feels like it makes some of the “fringe” strategies—like maxing out on the greenbelt track and developing along the river—way too dependent on getting lucky to be reasonable. Because the length of the round is variable based on die rolling, the game length can vary widely. On average, it comes in at a reasonable 60 to 90 minutes. But at times it has been over two hours. With four players the gameplay is at its best, but the downtime is also very significant. It’s also worth mentioning, Welcome to Centerville operates best with three or four players. If you are playing with two players, there is a third “robot” player each round that you must perform actions based on how the rules say they should play out. Nothing is more annoying for me than having spent a whole turn referencing a set of logic for the game to carry out. If you play primarily with two players, be warned. I certainly appreciate the attempt at adding depth to a familiar dice rolling mechanism. Welcome to Centerville gives you way more to consider each turn and as a fan of interesting decisions, I can applaud that. There is an interesting balance you have to do throughout the game to constantly change focus from wealth to prestige—whichever you are currently failing to get. But the consequence is that if you have a bad few rolls, there isn’t much you can do to mitigate those results. You can find yourself behind and have nothing really within your control to dig yourself out. This is exacerbated by the random ending of the round. While the time marker can only move a maximum of two spaces a turn (only two dice have the hourglass icon), you may know when the round could end, but never when it will end. In summary, Welcome to Centerville asks you to plan ahead and have a strategy, but doesn’t give you the ability to execute. 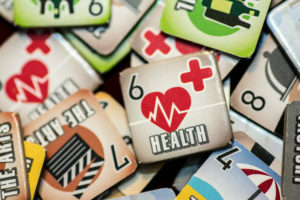 The game can drag on far too long and the theme doesn’t connect to the mechanisms in any meaningful way. Final Score: 2.5 Stars – An interesting take on Yahtzee that adds a bit of depth. But the pieces didn’t add up to a successful whole every time. • Having to manage both wealth and prestige adds layers to your options. • Player aid is fantastic and lays out perfectly what you can do on your turn. • Negative scoring for city scoring makes it impossible to ignore and makes the game feel less open. • Limited options for mitigating dice rolls. • Playing with 2 players requires operation of a “bot” player.